Can OmegaXL be taken with other medications? Each individual is unique, therefore, it is important to check with your healthcare provider before taking any supplement, especially when you are taking prescription medications. OmegaXL and the expiration date. OmegaXL is tested and certified to be at optimum quality for two years after the date it is manufactured when stored at the recommended temperature and humidity levels. At what temperature should OmegaXL be stored? OmegaXL is recommended to be kept at room temperature or below and out of direct sunlight, with as little humidity as possible. Is Flaxseed Oil a substitute for marine-based oil? Flaxseed oil is a rich source of the Omega-3 fatty acid alpha-linolenic acid (ALA). Some ALA gets converted in the body to EPA and DHA, but this conversion may not be adequate to meet the body’s need for EPA and DHA, therefore, greater amounts of flax are needed to have any benefit. Marine sources provide more bioavailable Omega-3s. Do I need to check with my doctor? OmegaXL is an all-natural source of Omega-3 essential nutrients derived from the green lipped mussel. However, before starting any supplement, it is important to check with your healthcare provider. Can I just eat more fish? Yes, eating more fish would be a healthy choice for most Americans, however, data from regulatory agencies suggests that freshwater fish in the United States may contain harmful chemicals due to industrial pollution leading to residues of heavy metals (like mercury) and organchlorine carcinogens (likd PCBs). Ocean fish are more variable with some species likely to be very clean, while others may be highly contaminated. It is difficult to make general guidelines regarding which fish are safe. The alternative way to receive Omega-3 fatty acids is through supplements. OmegaXL is derived from the green lipped mussel from the pristine waters of New Zealand. As one moves up the food chain, more and more toxins can accumulate depending on the diet of the fish. Mussels are near the bottom of the food chain and feed on the plankton that contain the Omega-3 essential fatty acids. A reasonable recommendation would be to eat moderate amounts of fish combined with OmegaXL supplements to ensure an adequate intake of Omega-3 oils. 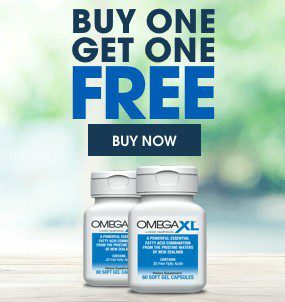 What are the benefits of OmegaXL? OmegaXL is effective at relieving joint pain due to inflammation, supporting joint mobility and function, and helping you maintain an active lifestyle. What are the principal ingredients in OmegaXL? OmegaXL’s principal ingredients are Perna Canaliculus proprietary oil extract, Natural monounsaturated olive oil, and Vitamin E.
Can I take OmegaXL if I have a sensitive stomach? Yes. If you have a sensitive stomach, we recommend you take OmegaXL with a meal.